Ministry of Propaganda - 08/Nov/2006: "Quick Travelogue Plug (Beinn Eighe Page)"
I completed a few more pages for my Scotland Summer 2006 travelogue. 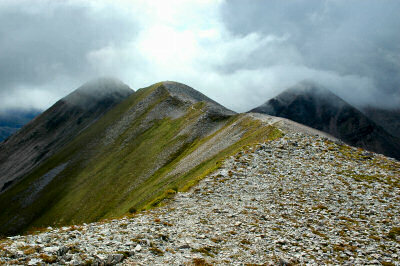 Mainly the Beinn Eighe (East) - Wester Ross page, but also two Quicktime VR panoramas. Quicktime VR panorama of a view north east from Beinn Eighe and Quicktime VR 180° panorama of a view from the Black Carls. I hope you enjoy all three pages, I had a great day on the hill despite the fairly low clouds. One day I'll be up there on a sunny and clear day (apparently they do exist...), the views must be unbelievable then considering what I already had on a fairly cloudy day. And for those interested in my job hunt: Registered with an agency yesterday who will now forward my CV to a potential opening. Had a telephone interview today, I hope I did well. Another telephone interview tomorrow and a few leads through agencies where I'm waiting for feedback if the employer is interested. In other words, keep your fingers crossed. Suggestions, recommendations etc for opportunities still welcome! When writing this entry the weather was: partly cloudy, still comparably mild. Probably cooling down soon though.